Have you been enjoying all of the awesome tote bag tutorials this week? Today we’ve rounded up even more sewing tutorials, decorating ideas, and an amazing crocheted tote bag. Who can resist an adorable lined tote bag with a monogram. Can you believe this beauty is all DIY! Jaime of That’s My Letter whipped up a classic monogrammed canvas tote. Drop cloths aren’t just for catching paint anymore! 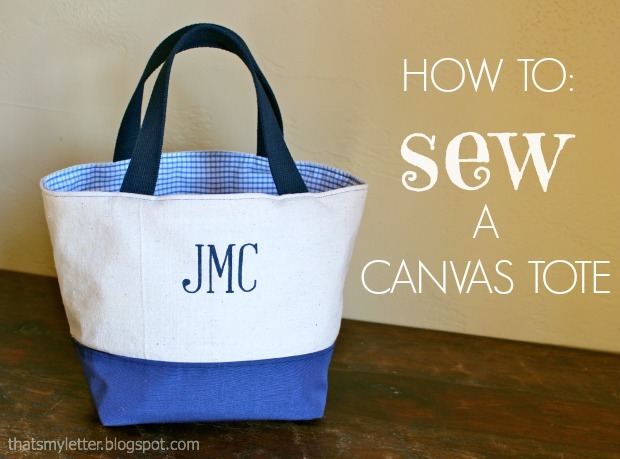 Heather of The Sewing Loft shows how to make an Easy Canvas Tote Bag out of painter drop cloths! What does the fox say? He’d say he’s head over heels in love with this tote bag. Perfect for back to school, Heather shows how to sew or iron on this fox applique with sweet embroidery details. Sandra from Sawdust Girl is famous for her amazing woodworking so it should be no surprise that she has a fabulous tutorial for Reversible Reusable Ruffled Grocery Bags. It’s okay to cheat a little. Grab a store bought tote and dress it up that plain tote bag with piping. This tutorial also shows a cheat for the non-sewer! Old shirt + another store bought tote = Adorable! Customizing a Totebag With an Old Shirt in an hour. This goes straight on my Christmas to-do list! I know, it’s hard to discard that favorite t-shirt. Now you don’t have to! Repurpose that favorite tee into a library totebag? Jessica from Mad in Crafts shares how easy it is in her step-by-step tutorial. What’s better than repurposing one t-shirt? Of course, recycling two shirts! On Creative Green Living, Carissa shares another t-shirt-to-totebag tutorial using two shirts. One makes a stylish liner. If sewing isn’t your thing (or, like me, you’ve “retired” from it), you can make this great market bag from a t-shirt, thanks to Creative Green Living. This is the ultimate eco-friendly bag. Do you have a perfectly usable tote but it has some company’s logo across it? Like that company you no longer work for. Add a no-sew pocket over the branding and pretend that job never happened. Instructions at Creative Green Living. There are so many quick and easy ways to decorate tote bags, regardless of whether you’re a handy crafter or not. You’ll find something to inspire you in this group. What to do when your daughter HAS TO HAVE a Hello Kitty totebag, but Target is sold out. A quick ‘n easy way to jazz up any plain bag is with Iron-On Transfers. HomeMadeville has the details. Rock n’ Roll is here to stay. Pull out your mixed tape, stencils and marks to create this rockin’ “Old School” Neon Tote by Morena’s Corner. The “Lost Tribe of Xanzabar” historical lecture class has never been so productive! Turn your doodles into a beautifully decorated totebag. Read Jessica from Mad in Crafts tutorial to make your own Simple Doodle Tote Bag. Markers are not just for posters and paper anymore! Fabric markers can dress up any blank tote bag, like this illustrated wildflower tote. Best of all, if you’re not comfortable with your own drawing, there are patterns for each flower. No excuses! Hippies never saw color like this! Jen at 100 Directions shows you how to Tie-Dye this Tote made from a t-shirt. Pretty, bold and bright! What do you get when you have two elephants in love? You get a cute Ombre and Tie-Dye Tote by Creative Living. I’ll go ahead and admit that ‘everything that’s old is new again’ and this Tie Dye and Batik Tote has a fresh nod to the ’70’s. Jessica from Mad in Crafts uses white crayons for batik and tie dye for a painterly look. You might think I’m kidding if I told you this bag wasn’t tie dyed. Mrs. Greene fooled us all with this Faux Tie Dye Tote Bag. Totes! Would you believe colored Sharpies and rubbing alcohol created this pattern? See for yourself. It’s hip to be square! Kim at Today’s Creative Blog gave this Color Block Geometric Tote a stylish new look with paint and painter’s tape. It’s so simple even the kids can join in. If squares aren’t your bag. Paint a simple striped and polka dot tote for a friend or yourself. This tote became an autograph bag as Amy’s friends wrote a greeting at each stop. This knit is knot to be overlooked! This fabulous Crocheted Market Bag by Delia Creates will turn heads. Absolutely gorgeous! Thanks for traveling down Tote Bag lane with me today! Loved reading through this. I’ve just subscribed so i can keep up with the new posts. Thank you!